Dubai is home to 2.7 million people from different ethnic backgrounds who share a very common interest; and that is food. Based on a research done by CBRE, the international real estate consultancy, the UAE has the largest number of Food & Beverage outlets per capita in the world. Dubai alone has about 9189 food outlets available in every corner. Unfortunately, along with so much food comes waste. Food waste costs Dubai the equivalent of $4 billion every year. It is the same as 2.7 kg of food waste being produced every day, per individual. The amount of food waste per individual goes up to 4.5 kg during Ramadan. Food waste is a serious and costly issue in the UAE. 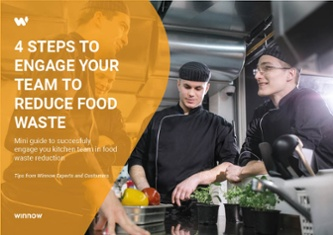 However, there is a growing awareness – particularly in the hospitality sector – that prioritizing food waste makes a strong business case: it can deliver significant cost savings and help protect the environment. The first solution to reduce the staggering amount of food waste during Ramadan will come from the UAE Food Bank. The project will encourage residents to donate surplus food to up to 100 food bank fridges across the country. During the month of Ramadan, food bank fridges will be set up in mosques, residential compounds and other public places. The UAE Food Bank project was inaugurated by Dubai`s Vice President and Prime Minister His highness Sheikh Mohammed bin Rashid Al Maktoum. The goal of the project is to reduce food waste and feed those in need of food within the country and abroad. The Dubai Carbon is looking at both households and the hospitality industry to prevent food waste throughout Ramadan. The organization is launching its “District Waste” campaign to help reduce food waste thrown away by families, eateries, hotels and food courts across the UAE. According to the CEO of Dubai Carbon, Ivano Ianelli, decomposing food in landfill creates 25 times more harmful greenhouse gas emissions than carbon monoxide. Dubai Carbon is the agency working to slash the emirates emission levels to limit warming below 2°C, a target set by the Paris climate conference (COP21) and 196 countries — including the UAE — to limit global temperature increases in coming decades. The campaign is part of the Dubai Carbon Abatement Strategy 2021, approved in December by the Dubai Executive Council, to stem greenhouse gases by 16 per cent by 2021. The UAE Ministry of Climate Change and Environment, partnered up with Winnow to organize an awareness raising event on food waste. The event – held in the presence of H.E. Dr. Thani Al Zeyoudi, Minister of Change and Environment – featured a panel with representatives from Accor Hotels, UAE Food Bank, Dubai Chambers and ADNH Compass Group. The panel discussion was in regards to reducing food waste in their kitchens and other initiatives undertaken in the UAE for food waste prevention and re-distribution. 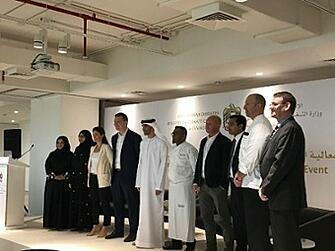 The purpose of the event was not just to raise awareness on the issue of food waste but start to highlight what the solutions are out there right now in the UAE. Dr Thani Al Zeyoudi, Minister of Environment and Climate Change, suggested that “A community effort across the country is needed to show restraint when cooking up huge food presentations for home guests or customers.” Dr Thani also discussed how the ministry is contributing to the Year of Giving by working on two food related projects. The first project is called The Fish Box; which aims to redistribute donated fish from fishermen and fish stalls to those in need with the help of local authorities. The second project is called Sphere Gardens; this initiative aims to target 28 schools from across the UAE and educate children about growing food. The UAE import 85% of the food it consumes, and by 2025, food imports are expected to rise to by 4x their current levels. Food waste is a strategic issue for the country. Fortunately, there is a growing awareness – particularly in the hospitality sector – that prioritizing food waste makes a strong business case: it can deliver significant cost savings and help protect the environment. “Since beginning our work here in the UAE early last year we are now working with over 30 properties. Our clients are saving over AED150,000 p.a. in food costs alone on average per site. Winnow is excited to be the first company in the region providing a tangible solution to the food waste issue within the hospitality and foodservice industry" said Marc Zornes, Winnow Co-Founder. The UAE have the real chance to take leadership in encouraging discussions and implementing actions to reduce the issues of food waste within the region and Dubai to be the first city in the Middle East to achieve zero food waste.